Am I Going to Hide or Stand Up for What I Believe? 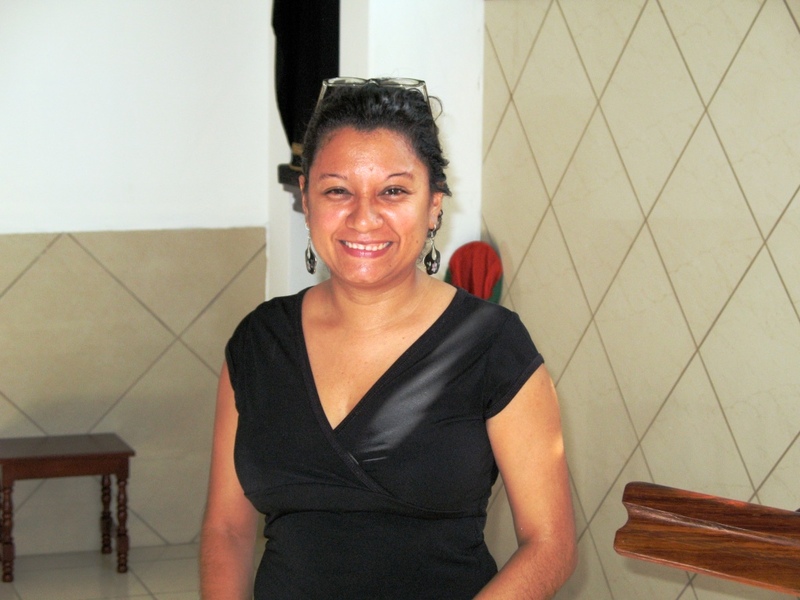 [Editor’s Note: Alma’s story revolves around the San Francisco parish, a large Roman Catholic community deeply involved in serving the population of over 400,000 persons in the Mejicanos area within San Salvador. 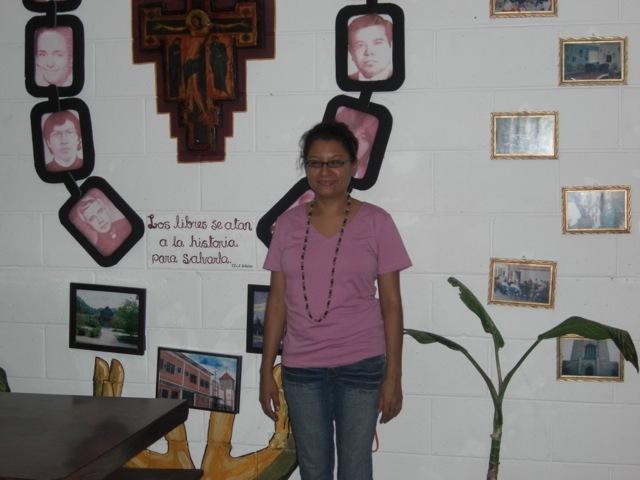 She makes many references to the numerous Salvadoran martyrs who lost their lives during and preceding the time leading up to the country’s 12-year civil war (1980- 1992). One of these martyrs is Octavio Ortiz, who was their parish’s beloved priest. A bit of background about Father Ortiz is necessary to appreciate Alma’s story and the story of her parish. Father Ortiz, having been raised himself as a peasant child, was the first priest to be ordained by Msgr. Oscar Romero. He took a special interest in youth, whom he took on spiritual retreats and seminars. The government was threatened by strong voices in the church and accused Father Ortiz’ retreat center of being a guerilla base. While Father Ortiz was leading a youth retreat on January 20, 1979, the government troops burst through the church gates in their tanks at dawn, killing Father Ortiz and four youths, ages 15-22, and arresting the others. The bodies were strategically placed to appear in positions that would support the military’s story of being the aggressors. Father Ortiz’ head was repeatedly run over by a military vehicle purposely so that the priest could not be presented in an open casket funeral. Msgr. Romero later remarked, “He gave his face to Jesus.” He is buried there on the church property. He was 35 years old. The topic for reflection Father Ortiz was leading that night was based on the question, “What does it mean for us to be light to the blind?” Jon Sobrino, prominent Roman Catholic priest, theologian, and teacher at the University of Central America, based much of his liberation theology on this quote. Last year I visited a German concentration camp. At one point I simply stood shell-shocked, unable to figure out what was agitating and arousing such feelings inside me. 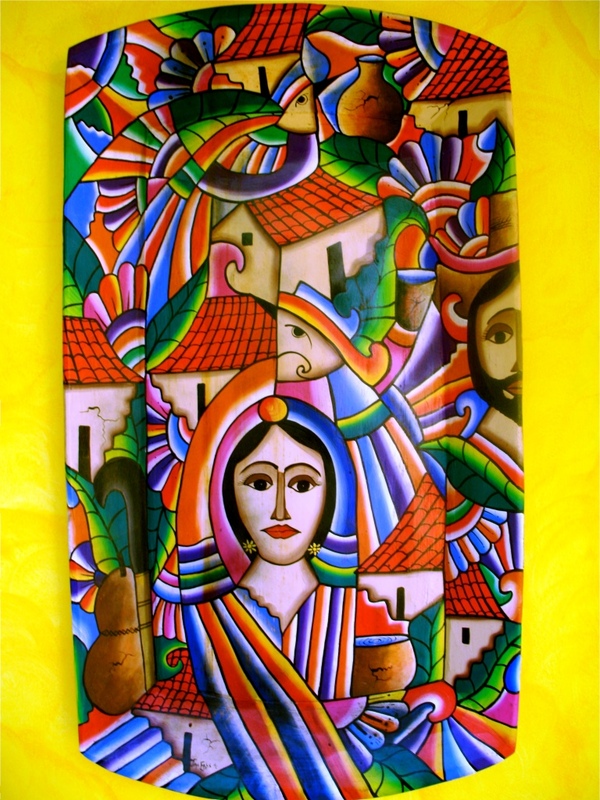 Then slowly the image that came to mind was something I had witnessed many years ago on the streets of San Salvador. It was the image of a man lying face up in the street with a crowd gathered around him who did NOTHING to help him. This person was in the organized struggle against the government oppression, and people just watched him die. I was among them. It happened all the time. No one dared take the wounded to a hospital, or you could be killed yourself. But I carried this guilt over doing nothing to help him. I questioned how I could continue to live when people who were trying to make a difference for others, people who were academics and clergy, were being targeted. Am I going to hide or stand up for what I believe? I learned to speak out when I was only eleven years old. I was the only girl in the family with two step-brothers. All my life my alcoholic step-father had been abusing me, including sexual abuse. When you live in a large family household, violence and abuse is not uncommon. Like so many victims, I often blamed myself for what was happening at first. When I broke the silence, the sexual abuse stopped, but the emotional abuse and harassment continued. Home was supposed to be safe. Home was supposed to be the place where you learned your values, but that was not true for me. I didn’t have extended family such as grandparents to support and protect me. Most of them died before I was born. My maternal grandmother had led the same difficult life of violence I did and did not live nearby anyway. I searched out the church when I was 16. It was a refuge, my oasis. It was at church where I found trustworthy people whom I could develop healthy relationships with. They took my hand and prayed with me. Church was and is my true home. Reconciliation was often a topic on spiritual retreats, and it has been a lifelong struggle for me to reconcile and forgive my step-father for his abuse. I discovered that to free ourselves of guilt sometimes we have to leave the situation. At age 24 I made the decision to leave home. I felt God supporting me in this decision which has been the best decision I have made. It allowed me the opportunity to construct a new life near my family but without their having a hold on me. Even now things are not totally healed but we are in conversation and the process continues. The other decision in my life when I felt God’s intervention dealt with the most important person in my life, my niece Andrea, who is now eight years old. She is my sister’s daughter. My sister had only enough money for herself to leave the country to join her husband in the U.S. She left Andrea, who was three at the time, to live with my mother, step-father, and me until she could raise enough money to send for her. I love Andrea dearly, but my mother and I had different perspectives on how to raise her. I discovered my step-father was repeating history and abusing her also. As hard as it was to give her up, I knew I needed to get her out of that situation and try to re-unite her with her parents in the U.S. There was no way to get her in legally, since the U.S. had closed its borders to immigrants. The only avenue was to hire a “coyote” and take the risks involved of getting her in illegally. In desperation I did my best, and two years ago, when she was six, I prepared a backpack of materials, such as crayons, coloring books, etc., that would keep her entertained while making the long journey ahead of her. I accompanied her to the Guatemala border. My instructions to the coyote I hired were clear: “Andrea is very special; she is intelligent. Be very, very careful to protect her. If you need to discard things, throw away extra clothes, but DO NOT get rid of the backpack. It is important to her.” For sixteen days I heard nothing. It was sheer agony for me. The priests were praying for her safety; the people in my parish were praying. Finally I got word that she made it to the U.S. To this day, that backpack remains always near her. It provides her security. I go visit her for a week every year. She gets permission to take time off school so we can be together constantly during that week. She is a very capable student and has won many awards. She remains a bright spot in my life. I can’t talk about my life without talking about the life of the martyrs in my own faith formation. I draw much strength from them personally, and our country owes them much in terms of our history and tradition. I was five years old when our priest, Octavio Ortiz, was assassinated. My youth group took his name to uphold his memory. We wanted to maintain the example he taught of the value of solidarity: to listen, to support, to fight for social justice, to read the Bible, to reflect on the reality of the times. I was with my group and our Catechist, Ricardo, when the peace accords were signed. It was one of the happiest moments of my life. Women were also affected in the war but sometimes in a different way. Often women were violated and raped by the soldiers. One of the members of this parish, an impressive woman, sold vegetables in the street. She had a social conscience and in her own oral methodology, despite being illiterate, would visit people and talk about justice. She was killed in a very cruel manner. Another sixteen-year old girl who worked in a sweatshop and advocated for children was stabbed in a death threat. She continued her work. In high school I studied to be a secretary and have worked non-stop since I was eighteen years old. In 2004 the project I worked on for the young and old closed. I was unemployed for 18 months. I had an American visa, so I went to Phoenix to work. I lived with an uncle’s partner in a very crowded house where people worked at all hours; there was drinking, and no one really seemed to talk with one another or seemed happy. I had a bad experience cleaning houses; the strong cleaning chemicals I was instructed to use had bad effects on my health, and I had to quit. Then I did babysitting, which was a better job, but I ran into a great deal of racism between the Mexicans and other Latin Americans in this area. I never experienced this before. To escape this I would spend a lot of time at the local library where I would get in line for the computer, spend my allotted 15 minutes, and then get back in line all over again just to avoid returning to that house. I asked myself why I was living in such disharmony when I could return to El Salvador and live in a community where people enjoy social times, have different values, and a different pace of life. Living in the U.S, I missed that. My involvement in the church has evolved over the years. I have helped the priests with the Liturgy of the Word and the Catechesis. Women are permitted more place in society and the church than they were when I was growing up. However, they still are not permitted to be ordained and give the Sacraments, a position which I disagree with. The mindset of women being inferior to men and needing to be submissive is still offensive to me. I feel I personally am more alive and full of life, able to act on my faith. I question everything but feel free to do so. If I feel inclined to march in street, I march. God is there for me in good times and bad times. My parish work gives much satisfaction. I realize the experience as a victim of childhood abuse allows me to be able to support women with an understanding I would not otherwise have. I feel the Holy Spirit guide me in my ministry when a woman knocks on my office door, explains her violent domestic situation, and I can respond by simply listening without judging or advising, offer a shoulder and smile while she shares her painful story. I can help empower her with some options SHE can ponder and choose or not choose to make. I trust that what I encourage comes not so much from me but from a higher source. I began studying social work at the university but now am changing my focus to psychology. I am not a serious student whose goal is for a career. Rigid, formal studies do not appeal to me. This is more of a hobby just to strengthen my work here in the parish work. The project I have been assigned right now involves the economics of the Mejicanos area. I’m involving the women in the area to help do the research. Sometimes people are fooled into thinking I am a lawyer or psychologist based on the experience I’ve gained over the years. I am 36 years old and a rarity in still being single. If I marry, I want it to be a very intentional decision, not a chance one. I have my own apartment now which I am paying off. After all the oppressive space I had to share for so many years, I am enjoying being free and living my youth. Besides from formal education, I feel I learn from the people who come to church and ask for help. They often teach me true solidarity, and we embrace true joy despite their pain. Because I give to others, they give to me. God smiles on me! I attended a conference which studied the process of war, examining other cultures coming in and striving to extinguish a culture. What was reinforced to me were the two distinct groups that El Salvador comprises: the indigenous people and the Spanish. Each is important in its own right and together the two create a rich, historical tapestry worth preserving. The indigenous people tend to be quiet and passive. They have a tradition of putting fruit at the base of a tree to thank Mother Earth for her richness. The Spanish want to fight struggles to overcome. They brought the Cross. On May 3 there is a tradition called the Day of the Cross, which combines the two cultures. Crosses are made out of wood, and fruit is placed at its base. It is believed if you don’t do this, the devil will dance in your home. It is a way to meld our culture and history into one tradition. It is important to expose our youth to these practices. Our people are strong because of our roots. We can withstand war, earthquakes, and hurricanes. When I see someone die as a product of violence, it hurts me to the core. But when a woman gains justice in the court, I experience a personal resurrection. I celebrate that, as a collective, we have hope that more women can be brave enough to speak out for their rights. My personal hope is that we are each a testimony to our faith, following the way the martyrs taught us to build a better world. This parish offers community outreach programs which include teaching marketable skills such as cosmetology; commercial baking; candle-making; printing; painting; pinata making; and child care and education in their school. Also counseling for victims of domestic abuse and violence, programs which Alma is involved in is offered.